Sportswear brand encouraged women to be their own muse. New Balance created an artificial intelligence-led experience to pick out women who it defines as "trendsetters" to give them a pair of new shoes. The brand launched the campaign "#BeTheException" in Madrid’s central Callao plaza to promote its women’s shoe and encourage people to be their own muse. 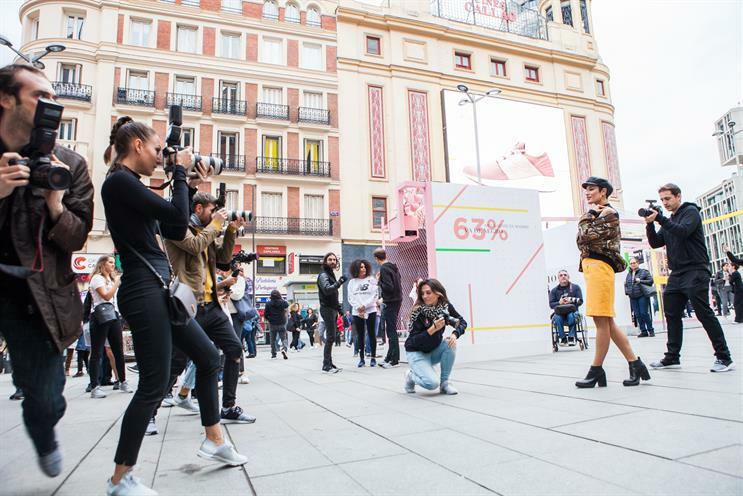 Brand experience agency Wildbytes developed a 'machine' equipped with AI software that was capable of picking out women who dress differently to the norm in Madrid. The women who were picked out were "transformed into fashion stars" with their image displayed on the large LED screens around the square, and paparazzi taking pictures of them. They then entered a VIP lounge to be interviewed by influencers on their style before receiving a new pair of the Fresh Foam Cruz Nubuck shoes. Daniel Scheidgen, marketing director at New Balance Iberia, said: "Once again, New Balance leverages technology and innovation as a way to express the singular brand's DNA. This time, we set out to reward urban and independent women whose exceptional styles do not follow trends. "Through an activation and campaign completely out of the ordinary, we utilised technology to tell the story of New Balance’s rich legacy and exciting future. #BeTheException innovates while celebrating the exceptional style and attitude that we love to see reflected in our clients." The experience took place at the end of October. New Balance will be creating similar activations in its stores at a smaller scale.